A rendering of the Riu Plaza hotel in Toronto, set to open in 2021. Spanish chain Riu Hotels & Resorts is plotting more growth in Canada, after agreeing to spend about $125-million building a new luxury hotel in downtown Toronto. For its second Canadian location, the family-run company is eyeing Vancouver, which, along with Toronto, is seeing strong demand for high-end accommodations. Riu is expanding as the number of luxury hotels increases in the two cities and the sector attracts more investment. “We are in discussions for potential Vancouver locations,” said Curtis Gallagher, a vice-president with Cushman & Wakefield. The commercial realtor is Riu’s broker in Canada. Mr. Gallagher declined to comment on how close they were to a deal, except to say they were looking for a site similar to its spot in Toronto, which will attract both business and leisure travellers. In recent years, investors from China, the United States, South Korea, Japan, Malaysia and Canada have been pouring funds into new hotel developments in Toronto and Vancouver. Hotel X Toronto opened with some investment from a South Korean fund. Trump International Hotel & Tower Vancouver was developed with Malaysian capital. U.S. hotel visionary Barry Sternlicht is investing in a luxury hotel brand for ecotravellers in Toronto. Riu, which has 93 hotels in the Americas, Europe, Asia and Africa, said about 400,000 Canadians stay at its hotels in Mexico and the Caribbean every year. With its new Toronto hotel, which will be part of its city hotel brand, Riu is hoping to win over the corporate world and customers from its resort locations. “We also intend to attract our loyal Canadian customers to experience our city hotel line,” Luis Riu, the chief executive of Riu Hotels & Resorts, said in an e-mailed interview through a translator. “In Canada, our focus has always been toward Toronto and Vancouver,” he said. Riu has partnered with Canadian developer Plazacorp on the Toronto site. The new hotel, which was announced in January and is set to open in 2021, will be in one of two buildings being built in the entertainment district. Called Riu Plaza, the company started the city hotel brand in Panama in 2010 and has since built ones in Guadalajara, Mexico; Miami Beach; Manhattan; Berlin; and Dublin. The name is not related to the development company. 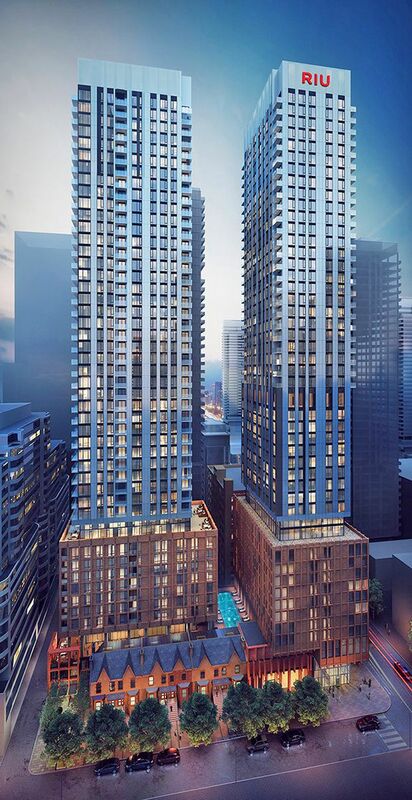 In Toronto, Riu Plaza will occupy the first 27 floors of the 48-storey building, while condos will make up the rest, according to Plazacorp. Next to the hotel-residential building, Plazacorp will erect a 50-storey tower that will be entirely residential. Although it is common for Toronto and Vancouver hotels to include a residential component, this is the first time a Riu hotel will share a building with residential units. “We were presented with this opportunity to invest in a project that included hotel and residential and we thought that the location, the volume of rooms and the construction project were perfect,” said Mr. Riu, whose grandfather started the family business in the 1950s. In Toronto, the occupancy rate for luxury hotels is 75 per cent and the average daily rate for luxury brands has climbed to about $485 a night, according to hotel data firm STR. Mr. Riu said Riu Plaza will be a four-star hotel, as most companies exclude five-star hotels in their travel policies for staff. “These companies are a very important segment for our city hotels, and due to this we opted to keep our offer at four-star hotels,” he said. The Riu brand comes to Canada as Florida authorities filed corruption charges against Mr. Riu and others in connection with the construction of a hotel in Miami Beach. Mr. Riu said he was very confident in a positive resolution to the allegations. “I know we are absolutely innocent,” he said. A Riu spokeswoman said the company is operating as normal.